The television I enjoyed as a kid lurches from the requisite Sesame Street to the mindless distractions of G.I. Joe, Teenage Mutant Ninja Turtles, Animaniacs, Ren & Stimpy and the green slime of many a Nickelodeon game show, with its slapstick schadenfreude. 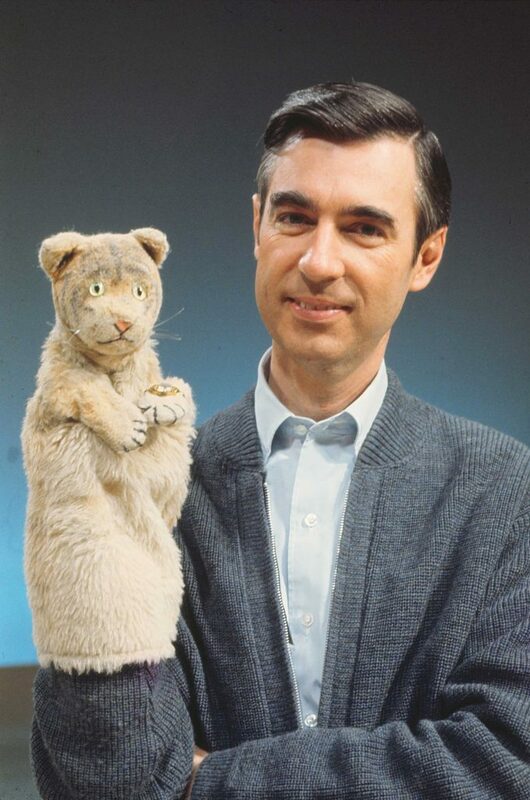 If there was any room for Fred Rogers’ earnest blend of puppet show and talk therapy, I have no memory of it. His iconic theme song has a melody familiar from decades of nostalgia and parody, but it seems I drove past his “neighborhood” in my prepubescent channel surfing, preferring wisecracking turtles and hotheaded Chihuahuas. After viewing Won’t You Be My Neighbor?, Morgan Neville’s comprehensive documentary about Rogers’ brave, groundbreaking life and legacy, it’s clear I missed out. In a fluidly paced tribute that stops just short of hagiography, Neville’s focus is less on the man himself— Rogers’ domestic life and his seeming asexuality are perfunctorily addressed, almost in passing — than on his pioneering program. Interviews with friends, crew members and biographers, along with the trove of footage expertly curated from 1968 to 2001, cements the canonization of Mister Rogers’ Neighborhood. Moreover, the movie belies its creator’s popular image as a hopelessly square, sweater-sporting teetotaler who launched his brand as a wholesome counter to the long hair, free love, and epic trips (2001: A Space Odyssey premiered the same year as his show) percolating elsewhere in the culture. Yes, Rogers was a lifelong Republican, and he probably tsk-tsked the burners of bras, flags and draft cards. But by any 21st-century definition, he was a progressive. As Neville reminds us, without underlying the point too much, one of his earliest shows featured a despotic king resistant to shifting demographics (“Down with the changers!” he chanted) who advocated building a wall between his castle and the Others. Rogers was antiwar and antisegregation, boldly casting a black man, Francois Scarborough Clemmons, as his neighborhood’s Officer Friendly, and welcoming him to dip his tired feet in the same kiddie pool as Mr. Rogers. More surprising, perhaps, than Rogers’ forward-thinking politics was the sheer radicalism of his show. He did weeklong specials on death, on loss, on divorce. His leisurely formalism flew in the face of the ADD pacing of his competition. He would change light bulbs on the air, and practice breathwork techniques with his audience. He once set a timer to a minute of silence, just to give kids a sense of what it feels like. Mister Rogers’ Neighborhood also proved that bells and whistles were not necessary to push a message, that children could be rapt by lengthy close-ups of what one interviewee describes as a “dingy sock puppet” named Daniel. As voiced by Rogers, this tigrine avatar conveyed the anxieties and insecurities his target audience couldn’t voice for themselves. In one of the best clips chosen to illustrate this capacity, Daniel engages in a frank discussion with a human co-star about assassination in the wake of the killing of Bobby Kennedy. In another, he asks that same companion if his very existence might be a mistake. In Rogers’ portrayal, it’s not so absurd to suggest that a puppet could have a soul. Rogers died too young, at 74, in 2003, and Neville and his interviewees rightly suggest that his void has remained unfilled on the people’s airwaves. Described by one subject as “scarily open,” he was a wellspring of compassion and nurture. He spoke in a measured, deliberate cadence, understanding that his every word mattered. It’s a tendency that was apparent in his legendary testimony to the U.S. Senate in 1969, successfully convincing a Republican-led effort to defund public broadcasting to change course. He killed his opposition with kindness instead of the righteous bromides of his fellow-speakers. Decades later, righteous bromides have won. The influence of Mister Rogers’ Neighborhood began to wane around the time Fox News ascended, its empty-headed commentators quick to deride this most unlikely of targets. As we see in clips, Brian Kilmeade and Bill O’Reilly — one of whom, it doesn’t matter which, labels Rogers as “evil” — took issue with Rogers’ assertion that every child was “special,” bizarrely finding fault in his simple self-help affirmations such as “I like you as you are.” In the world of the Fox alphas, this sensitive beta created a nation of entitled snowflakes, a provocation whose lack of empirical support meant little to the dittoheads. For all of its subject’s healing positivity, Won’t You Be My Neighbor? — its very title an invitation to community — leaves a sour aftertaste. Division and rancor rule television now, and with rare exceptions like Bill Nye, even kids’ programming won’t dare to broach subjects that might be construed as political. Mr. Rogers is a relic of another time. I only wish I appreciated him during that time, instead of reveling in neon slime. WON’T YOU BE MY NEIGHBOR? Director: Morgan Neville; Distributor: Focus Features; Rating: PG-13; Opens: Friday at The Classic Gateway Theater in Fort Lauderdale, Paradise Park 24 in Davie, Regal South Beach in Miami Beach, Coral Gables Art Cinema and Sunset Place Dolby Cinema in South Miami. It expands to Palm Beach County theaters on June 29.